Bodyguard is a specialty rank for Jiralhanae serving in the Covenant. They serve as bodyguards for Jiralhanae Chieftains and other Covenant political figures. Bodyguards are responsible for the protection of their pack's Chieftain as well as for the enforcement of tribal law and/or military law. Whenever there is a Chieftain nearby, one can expect to encounter Jiralhanae Bodyguards, which look very similar to Captains. During the Great Schism, some Jiralhanae Bodyguards served as the High Prophet of Truth's personal protectors. They wear Jiralhanae power armor that is similar in appearance to the Jiralhanae Captains, but it is colored a pale blue. Their armor comes in two variants: a more common, silver-blue (with red under-armor) variant, and a less common, silver armored (with red under-armor) variant. Jiralhanae Bodyguards seem to favor Covenant weapons such as the Type-25 plasma rifle and Type-51 carbine rather than their own native technology, but they have been seen wielding the powerful and deadly Type-25 Brute shot and the Type-52 mauler. Bodyguards are equipped with a bubble shield for additional protection and regenerators to heal themselves in combat, on the battlefield. Jiralhanae Bodyguards utilize power drains to interfere with all electronic equipment and the energy shields that belong to hostile forces. Jiralhanae Bodyguards are usually seen wielding Type-25 spikers, plasma rifles, Covenant carbines, maulers, and occasionally Brute shots for greater range. 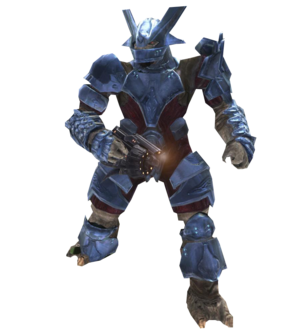 Despite its resemblance to a jiralhanae Captain's armor, a Bodyguard's light, pale blue Power Armor is actually only around the same strength as a Jiralhanae Majors. On Heroic and Legendary, it only takes 1 beam rifle or sniper rifle shot to destroy their power armor, while 2 shots are required to destroy the power armor of a Jiralhanae Captain of any rank. On Heroic difficulty, it takes roughly 29 assault rifle bullets to kill a Jiralhanae Bodyguard; 10 shots to drop their shield, and an additional 19 shots to kill them. Jiralhanae Bodyguards almost always carry one piece of equipment; a power drain, bubble shield, or regenerator. They seem to overwhelmingly favor the regenerator, often using it to support their Chieftain by helping to rapidly recharge his shields. When encountering a Jiralhanae pack that is led by a Chieftain, it is standard Jiralhanae tactics for the Jiralhanae Minors/Majors to advance on the player while the Bodyguards hang back to protect the Chieftain, even going so far as to move into the player's line of fire to shield the Chieftain with their bodies if he starts taking gunfire from long range. If the Chieftain retreats (such as during the final encounter in The Storm), the Bodyguards will also fall back with him while the remaining Unggoy and Jiralhanae remain behind to delay the player's advance. Jiralhanae Chieftains are typically accompanied by 2 to 4 Bodyguards. Jiralhanae Bodyguards can quickly dispatch the player's shield with plasma rifles, and maulers. Their power armor is highly susceptible to plasma-based weaponry, with the plasma rifle and the plasma pistol's overcharge shot greatly exemplifying this. As with other power armor, once disabled, its shielding will not recharge. With their helmets removed, any head shot will then quickly eliminate the Bodyguard. A single headshot from the beam rifle or sniper rifle will kill a fully armored Jiralhanae Bodyguard, even on Legendary difficulty. The left shoulder pad of the armor is almost identical to the one worn by Tartarus, albeit smaller. An action figure was modeled after a Jiralhanae Bodyguard by McFarlane Toys, the creators and manufacturers of the popular Halo action figures. It was released alongside the other figures in the sixth series. It comes with a spike grenade and a Brute Shot. The regular Jiralhanae Captains and the typical Jiralhanae Bodyguard, look almost exactly the same (especially in dim lighting), but there are in fact slight differences in their power armor color and power. The Captain regulars have a violet tinge to the armor, but the Bodyguards have a more indigo color and their under-armor and garments are light crimson; however, in the heat of combat it's extremely difficult to differentiate between the two ranks. They replace the Jiralhanae Honor Guardsmen from Halo 2. A pair of Jiralhanae Bodyguards. A Jiralhanae Chieftain and his Bodyguards. A pair of Jiralhanae Bodyguards flanking a Chieftain.